My story Cullsman #9 is now available to buy in Andromeda Spaceways semi-pro zine, in edition 55, here. I first wrote Cullsman some 5 years ago, inspired by an idea I had 10 years ago, of a galactic hunter-gatherer ‘snail’ civilization that trawls across the universe dragging its own Dyson sphere with it, stopping to harvest planets along the way. Awesome? I always thought so, but I couldn’t make the story kick the way I really wanted to- it was all idea and no forward momentum. Then a year ago I dusted it off, completely rewrote it, and am now totally proud of the result. It even features King Trunk, a slight ad-lib on our family pet here in Tokyo, King Frog. Watch out for his appearance. So what is Cullsman #9? It’s a story about the lengths we’ll all go to to protect our own, about genocide, love, loss, and leadership in the face of stone-cold terrorism. There’s some humor, devastation, and gentle echoes of Asimov’s Foundation. 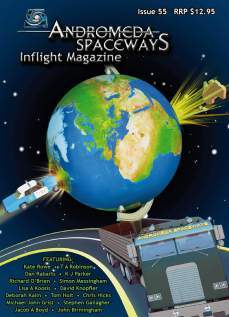 You can find it on the Andromeda Spaceways products page- that’s here– edition 55. Not 56, which is above, but 55, which came out after 56 for some reason. Of course there are lots of other stories in it too, which I’m certain are great- though I haven’t had a chance to read them yet. You can get print or ebook formats. If you do get it, I’d love to hear what you think below :). Again, find Cullsman #9 at Andromeda Spaceways edition 55 here.